Pizza sauce is the soul of any pizza. It is the main ingredient that provides a tangy and aromatic flavor to the pizza. 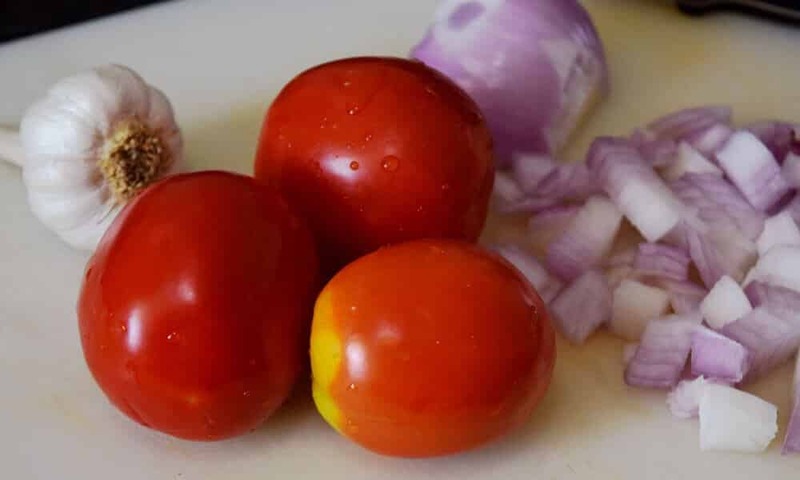 This easy to follow homemade pizza sauce recipe will make your pizza healthier. No taste enhancer and zero preservatives. This homemade pizza sauce is absolutely safe for your kids to consume. I advocate baking at home. 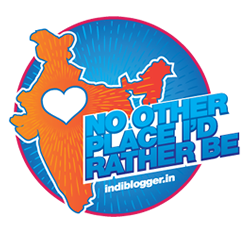 The pleasure to feed preservative free food to your loved ones is incomparable. Except for basic ingredients, I try to keep everything homemade. Homemade is always better and tastier. You have complete control over the quality. So I always keep a ready stock of my homemade sauces. Want to make healthy condensed milk at home? Read the Recipe. Remember, the goal is to eat preservative-free food. 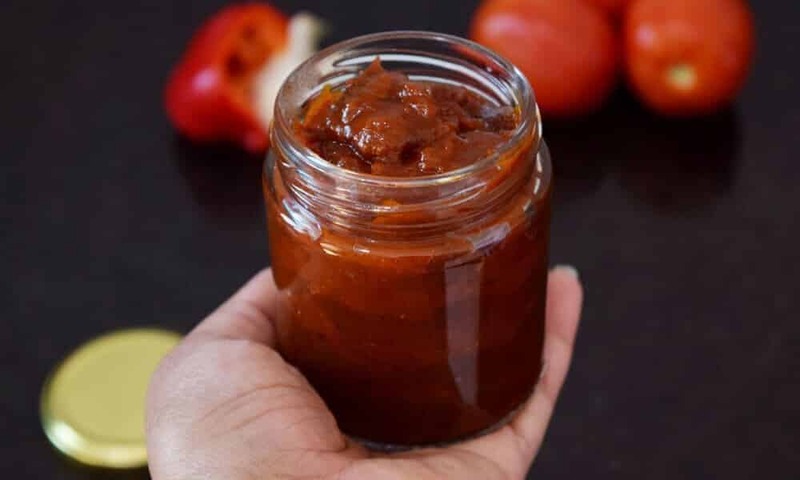 For homemade pizza sauce recipe, we don’t need expensive or fancy ingredients. You will find all these ingredients readily available in every kitchen. We need onions, tomatoes, garlic, dry herbs, salt, and oil. That’s all. 15 minutes of your time and you will have preservative-free pizza and pasta sauce. Yes, I use the same sauce to make pasta too. 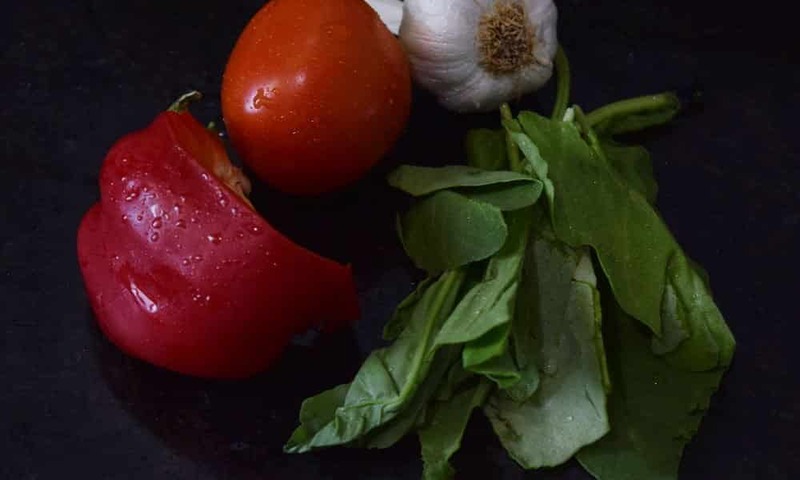 I will also use red bell pepper and fresh basil leaves in our pizza sauce recipe. Roasted bell pepper will add smoky flavor to our pizza sauce. And basil leaves will add the aroma and taste of pepper and mint in our homemade pizza sauce recipe. Wash your bell peppers and roast them on a gas stove. Once done, immediately put them into a bowl of cold water and rub them to remove the burnt skin. Mesh them to make a puree of it. Heat oil in a pan. Add minced garlic and sauté it for 5 seconds. Now add chopped onion, tomatoes, basil, roasted bell pepper puree. Also, add all the dry spices mentioned in the ingredient list. Stir everything and cover the pan with a lid. Let it cook on a medium flame for about 5 minutes. After about 5 minutes, open the lid. Check the seasoning and adjust accordingly. Switch off the flame. With the help of a hand blender, blend everything to a smooth sauce. In case you don’t have an electric blender, potato masher can also serve the purpose. 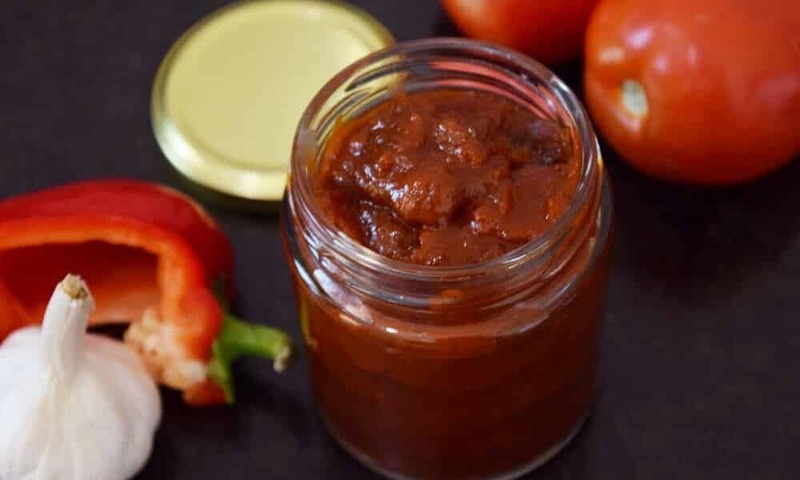 You need to blend all the ingredients to get sauce with a spreadable consistency. Our homemade pizza sauce is ready. Bring it to room temperature and transfer it into a sterilized glass jar. 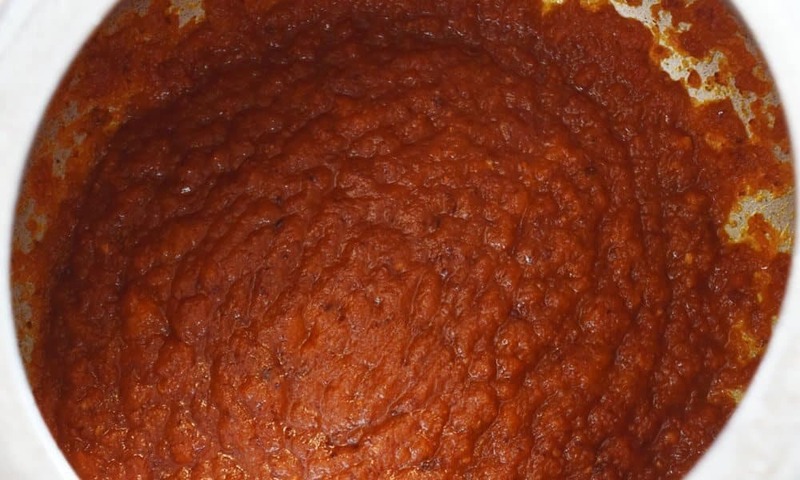 You can store this homemade pizza sauce in refrigerator for up to two weeks. So now onwards, no more market made pizza/pasta sauce! Say NO to preservatives. Eat Healthily. Super Quick & Easy Homemade Pizza Sauce Recipe. 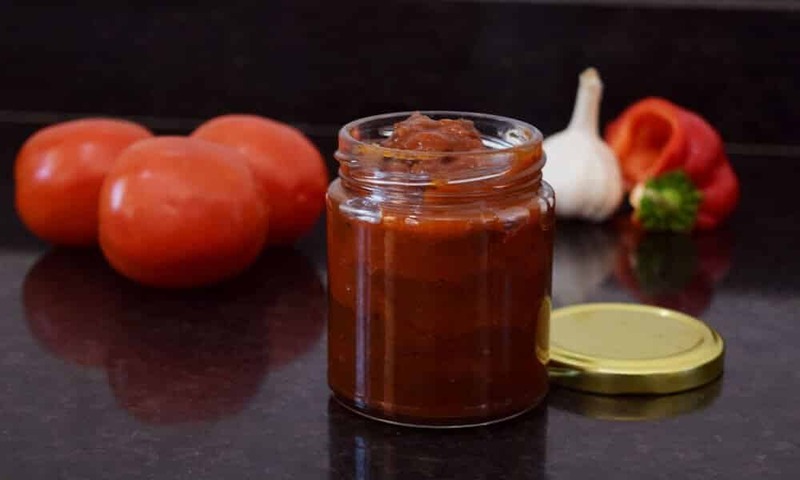 A healthy preservative pizza sauce recipe that is completely safe to eat for kids. To roast the bell pepper, wash it and roast it on a gas stove. Once done, immediately put it into a bowl of cold water and rub it to remove the burnt skin. To make the sauce, heat oil in a pan. Add minced garlic and sauté for 5 seconds. Add chopped onion, tomatoes, basil, and roasted bell pepper puree. And add all the dry spices mentioned in the ingredient list. Stir everything, cover the pan with a lid and let it cook on medium flame for 5 minutes. After 5 minutes, open the lid. Check the seasoning and adjust accordingly. Switch off the flame and using a hand blender, blend everything to a smooth sauce. Bring it to room temperature and transfer it to a sterilized glass jar. Our pizza sauce is ready. If fresh basil is not available at your place, you can add dry basils too. You can replace olive oil with any regular cooking oil. However, using olive oil will enhance the taste. Few people don’t like the flavor of garlic. You may skip it. All the ingredients are given with measurements. All the possible substitutes are also mentioned. Apart from that, any other change will change the final outcome. You can try at your own risk. Hi Sonia, thank you so much for your pizza sauce recipe. Just wanted to check if the what colour bell pepper did you use for this recipe? I have used red bell pepper as it will enhance the taste as well as color. Beautiful sauce. N thx u for the well written receipe notes. I am allergic to raw onions and can consume only browned ones. Can i either add browned onions or skip them altogether? In this recipe, I have sauteed onions for 3 min but in case you want to skip then you can.